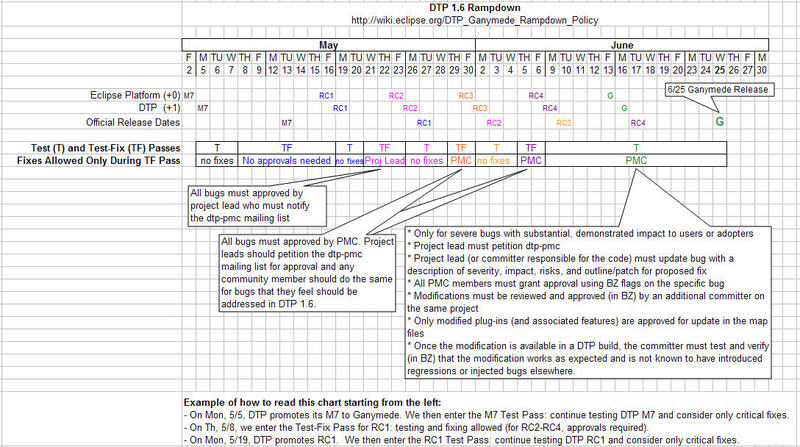 Difference between revisions of "DTP Ganymede Rampdown Policy"
*During a test/fix phase for RC1 and RC2, we will do regular daily builds. In test/fix phases for RC3 and RC4, where approvals are needed, we will not build nightly, but will build as needed (5/29 and beyond). *During the test/fix phase for RC1 and RC2, we will do regular daily builds. In test/fix phases for RC3 and RC4, where PMC approvals are needed, we will not build nightly, but will build as needed (5/29 and beyond).